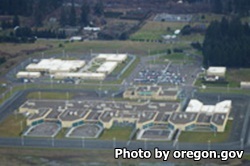 Coffee Creek Correctional Facility is located in Wilsonville Oregon. It is a mixed custody facility that houses up to 1,685 female offenders, and is responsible for the intake and classification process of up to 432 male offenders and female inmates. The females at this facility are housed in two buildings, the minimum facility and the medium facility. Coffee Creek Correctional Facility participates in the Oregon Corrections Enterprises industries employing inmates in a textile operation, converting/scanning documents, as call representatives for the Department of Motor Vehicles, and in CAD. Coffee Creek Correctional Facility offers a large number of programs to the inmate population. Life skills programs at this prison include Yoga, girl scouts beyond bars, quilting, crafts, choir, theater group and more. Inmates also have access to the library, including both a general reading library and a law library. Offenders who do not have a diploma can take adult basic education classes and obtain a GED during their sentence. Mental health services, necessary medical treatment, and dental care are all provided to inmates. Inmates can participate in additional programs that are family oriented and based around parenting and maintaining healthy relationships. Furthermore offenders can partake in a large amount of religious worship services. For a complete list of all the programs available at this facility click here. Saturdays, Sundays, Mondays, Tuesdays and Wednesdays from 1:30pm-4pm and 6pm-9pm.